A St. Agatha man escaped serious injury during a single vehicle accident caused when he fell asleep at the wheel of a pick-up truck early Sunday morning, according to Maine State Police. ST. AGATHA, Maine — A St. Agatha man escaped serious injury during a single vehicle accident caused when he fell asleep at the wheel of a pick-up truck early Sunday morning, according to Maine State Police. Chance Gervais, 20, was operating a 2012 Dodge Ram travelling south on Main Street in St. Agatha when he fell asleep shortly after 5 a.m. on Sunday. 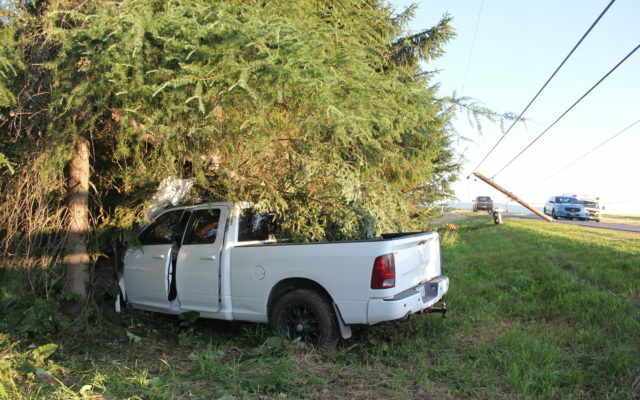 The pickup left the roadway, and collided with a telephone pole and multiple trees before coming to a stop in a wooded embankment. “Wires from the telephone pole blocked the roadway, causing traffic to be redirected. Electricity to some homes in the area was temporarily lost,” according to a press release which the Maine State Police issued on Sunday afternoon. Members of the Madawaska Ambulance Service transported Gervais to Northern Maine Medical Center in Fort Kent for treatment of non-life threatening injuries. EMERA Maine repaired the telephone pole. Gervais was wearing his seatbelt and speed was not a factor in the accident, according to police. The Dodge pick-up was destroyed and had to be towed from the scene. Members of the St. Agatha Fire Department assisted at the scene.